A multispeed bike allows you to comfortably ride at different speeds across varying terrain. Each speed on a bike refers to a different combination of gears. By changing the combination of these gears, you can make it more or less difficult to pedal. Despite the number of gears, it is simple to learn to ride a 21-speed bike. It's difficult to enjoy biking when your feet can barely move the pedals or when the pedals spin so fast your feet cannot keep up. According to Coach Levi, a cadence of 75 to 90 pedal rotations per minute is comfortable for most bikers. Adjusting the gearing of your bike allows you to keep this pedaling cadence when traveling at any speed. A 21-speed bike has three front gears and seven in the rear. The front gears sit in line with the pedals and are called chainrings. The rear gears are in line with the axle of the rear wheel and are called the cassette collectively and cogs individually. The large and small chainrings are intended for extreme circumstances: large hills or fast road riding. 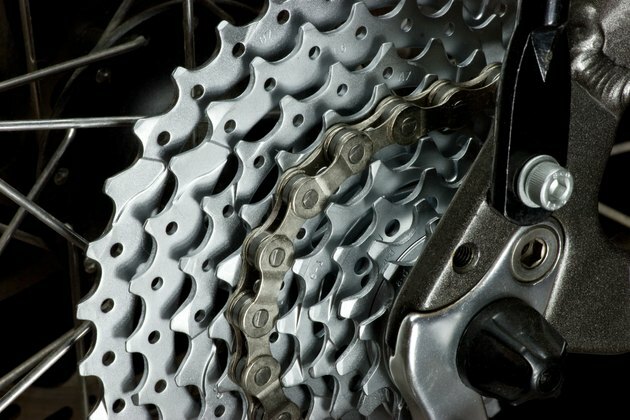 Don't use the small chainring with the smallest cogs in the cassette or the large chainring with the largest cogs. This places the chain at too much of an angle, increasing wear on your bike and raising the risk of your chain jumping off the gears while riding. A derailleur is used to switch between gears. The derailleur is controlled by shifters mounted on the handlebars. Typically, the left shifter controls the chainrings and the right shifter controls the cassette. The shifter changes the position of the derailleur, causing the chain to derail from the current gear and jump to the next larger or smaller gear. You need to continue pedaling to shift gears. Choosing the right gear is based on your personal preference. Choose a gear you find comfortable. Begin with the middle chainring and a medium cog in the cassette, number four on a 21-speed bike. Make small adjustments with your left shifter to adjust the cassette. To speed up your cadence, choose a smaller cog such as numbers five, six or seven on a 21-speed bike. To slow down your cadence, choose a larger gear such as numbers one, two or three. If the number one or number seven cog is not fast or slow enough for you, move your cassette back to number four and adjust the chainring. Anticipate shifting gears before you reach an obstacle such as a hill. If you wait until you're halfway up a hill and can barely pedal, shifting gears is difficult. Pedal softly for a few rotations as you shift gears. Too much pressure can prevent gears from shifting, resulting in grinding between the chain and derailleur.